The Ju 87 B series was to be the first mass-produced variant. A total of six pre-production Ju 87 B-0 were produced, built from Ju 87 An airframes.Test flights began from the summer of 1937. A small number, at least three, served as conversion Cs or Es for potential naval variants. The first production version was the Ju 87 B-1, with a considerably larger engine, its Junkers Jumo 211D generating 1,200 PS (883 kW or 1,184 hp), and completely redesigned fuselage and landing gear, replacing the twin radio masts of the "A" version with a single mast mounted further forward on the "greenhouse" canopy, and much simpler, lighter-weight wheel "spats" used from the -B version onwards, discarding the transverse strut bracing of the "A" version's maingear design. This new design was again tested in Spain, and after proving its abilities there, production was ramped up to 60 per month. 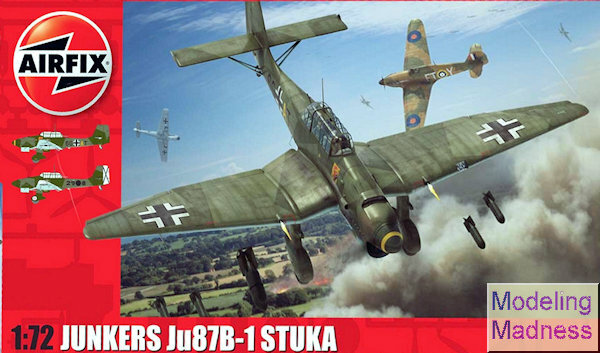 As a result, by the outbreak of World War II, the Luftwaffe had 336 Ju 87 B-1s on hand. The B-1 was also fitted with "Jericho trumpets", essentially propeller-driven sirens with a diameter of 0.7 m (2.3 ft) mounted on the wing's leading edge directly forward of the landing gear, or on the front edge of the fixed main gear fairing. This was used to weaken enemy morale and enhance the intimidation of dive-bombing. After the enemy became used to it, however, they were withdrawn. The devices caused a loss of some 20–25 km/h (10-20 mph) through drag. Instead, some bombs were fitted with whistles on the fin to produce the noise after release. The trumpets were a suggestion from Generaloberst Ernst Udet (but some authors say the idea originated from Adolf Hitler). Total production amounted to 697 B-1s (311 by Junkers, 386 by Weserflug) and 225 B-2s (56 by Junkers, 169 by Weserflug). The last Ju 87B rolled off the production lines in October 1940. Hornby continues to make Airfix a highly successful company, having pulled it from the ashes of receivership where the the previous owners had driven it. It was much to everyone's delight when Hornby purchased the company as they have pulled several other companies from oblivion and made them highly successful, mainly by revamping what was there. In the case of Airfix, it meant a program of issuing new tool kits, some of them old favorites and some of them new subjects. In the area between old favorites and new subjects, we have this latest release. This is the first time the Ju-87B-1 has been tooled in this or any other scale and I know that many of us are delighted that this happened. The B-1 variant was a major player in the first year of the war and the aircraft that gave the Stuka its reputation. Since the B-1 was built in nearly twice the numbers of the B-2, it has been a mystery why it has taken so long to have a kit of this version. This latest kit is typical of the most recent releases with engraved panel lines and semi-soft plastic that seems to be the norm for non-Japanese kit makers. It is also nicely engineered and it is obvious from the way the parts are arranged that Hornby plans for other variants to be kitted. The interior floor includes some beefy short spars to hold the wings later in the build sequence. We have a nice choice of pilot seats, one with belt detail and the other without so that the pilot figure can fit more easily. Rudder pedal stubs are molded onto the wing itself and one sticks the control column as well as the rear gunner's seat onto the cockpit floor piece. The kit comes with sidewall pieces and the instrument panel fits into a fuselage half. 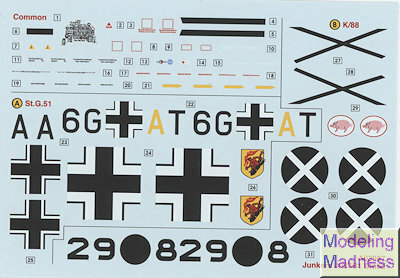 A decal is supplied for the main panel. Something I do not recall seeing in other 1/72 Ju-87 kits is a bomb aiming window just behind the engine cowling. Once the fuselage halves are closed, the instructions would have you mount the upper wings first, followed by the lower wings. This will ensure that they fit over the spar stubs. One will need to open holes in the wings for the outer bomb racks if one wishes to use those. It seems that one could also install drop tanks on the outer wings if one wishes to make a Ju-87R-1. The major difference between the B-1 and later B-2 is the engine cowling. Airfix has gotten this right with the stub exhaust and more rounded upper radiator. This is built up as a 'power egg' and attached to the rest of the airframe. The nose and prop are on a separate sprue, indicating that it will be easier to do the B-2/R/D/G series later on. The wheels are flat spotted on one side for ground display, and if one wishes to portray it in flight, one simply reverses the wheel. This is accomplished by having a tab on the wheel that fits into a slot inside the wheel legs. One also has the option of adding the stub for the siren. Though not shown in the instructions, the kit includes a stub with the prop siren as these were frequently used on early war Stukas. The scream of this prop in a dive is what helped add to the terror of being under attack by this aircraft. Dive brakes are a single piece that fits into holes in the wing that were opened earlier. 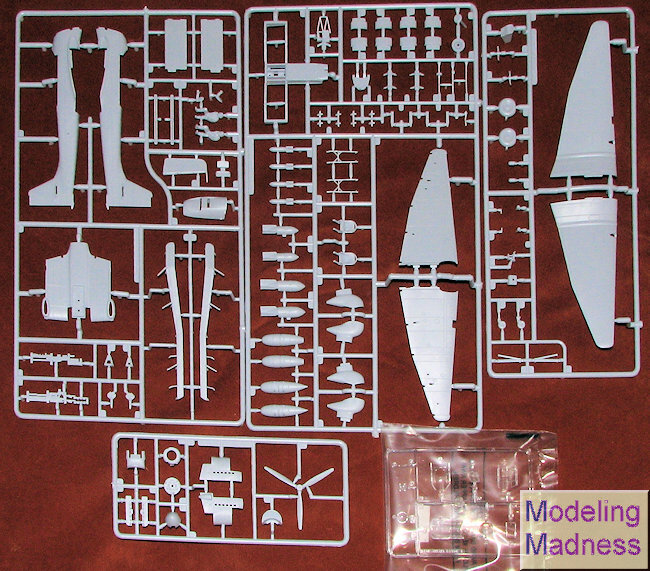 The aileron and flap assembly is also a single piece that includes the aileron mass balances, something Airfix has omitted in several previous Luftwaffe kits. The shape of these balances is not good, but at least they are there. For the main bomb load, one has a choice between two bomb sizes and to accommodate these differences, two different bomb crutches are provides. For those thinking that there should be a roll over assembly and radios for the back seat, this is not added until the end of the build when one also attaches the clear bits. There are two central canopy sections provided for open and closed main canopy. The prop assembly is the proper thin bladed propeller and can be built up and installed after everything else is built and painted. Instructions are very nicely done with color areas to assist with building the kit. Paints are Humbrol numbers except for the overall camouflage when names are also provided. Both markings options are standard bomber shades of RLM 70/71/65 with the upper colors in a splinter camouflage. The box art plane is from 9./StG 51 in France during August 1940 while the other is from the Spanish Civil War in last year of the war. This plane has a white rudder and wing tips. The decals are nicely printed and without swastikas. I am sure there will be a number of aftermarket decal sheets to cover this variant now that the kit has been released. It is great to see this variant finally kitted. It has sold quite well at the LHS so it looks like Hornby has another winner here. A 1/48 version is in the works as well for those who prefer the larger scales. Thanks to your editor for this one.